I just spotted in a Pew report on climate change opinion the poll question "How much do you, personally, care about the issue of global climate change? ", with one of the optional responses being "some". Hmmm "I care some about Climate Change"..? Of course we hear this sort of construct a fair bit on American TV, but I always thought it a Southern colloquialism, and didn't know it had become accepted US grammar. Views? As a native Californian I have no trouble understanding that sentence but I don't think I'd ever actually use it in conversation. I think it's most likely an awkward construction that comes out of social science jargon. 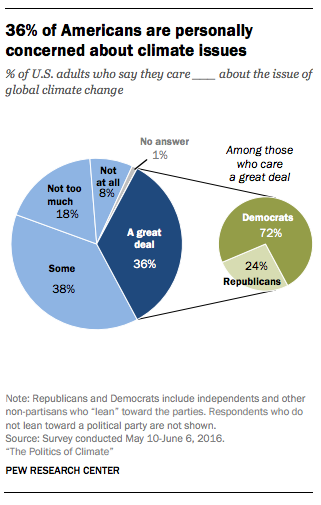 Poll questions commonly take this kind of form: "How much do you care about Climate Change? Circle one: 1) Not At All, 2) Some, 3) A Lot". Sometimes this is modified into awkward sentences, like so: "How much do you care about Climate Change? Circle one: 1) I care not at all about climate change, 2) I care some about climate change, 3) I care a lot about climate change." Pollsters care more about perfectly standardized parallelism than natural phrasing because the point is to assign potential answers a quantified score that is then amenable to statistical analysis. Also, when something is part of the jargon of your profession, it tends to sound completely natural to you even when it is not standard colloquial English. You should note that some there is short for to some degree or to some extent. It doesn't necessarily mean some is used as an adverb. There are following choices; A great deal, Not too much, Some, Not at all. Some just indicates a degree (extent). It doesn't necessarily mean it is used as an adverb in a given sentence. For this context in American English, some is actually somewhat, informally shortened. pronoun Used to make a statement or description less forceful or definite. "He felt somewhat awkward in his suit." "Our work has progressed somewhat." "The course is somewhat more difficult than I was told it would be." I guess I like him some. "I care some" is definitely an informal AmE idiomatic usage. As N. Post says, the use of "some" rather than "somewhat" in this question was probably influenced by the use of a poll format with other options such as "not too much," "not at all," and "a great deal" which don't have separate adverbial forms. J O S H, kayleeFrye and Rathony mention the use of "some" as a general substitute for "somewhat." However, I think for some people, there is something about the verb "care about" specifically that makes "care some about" sound more natural than it otherwise would. I grew up in California; when I read the title of your sentence I couldn't figure out what the problem was supposed to be. After reading the answers, I agree that "somewhat" sounds better in this context, but the version with "some" doesn't sound ungrammatical to me. On the other hand, I think "I guess I like him some" (the Collins example that J O S H mentioned) sounds more noticeably colloquial to me. Another thing that seems related is the use in negative sentences of "any" without any following word, in place of "at all." To me, this seems kind of possible, but marginal; I feel like I might try to use "any" in such a sentence, but when I look at it or hear it I feel uneasy. You can find many examples of "don't care any about" online using Google search, but the sequence "care any about" doesn't show up in a search of the Google Ngram Viewer. This indicates that it occurred in less than 40 books in Google's corpus of scanned books published earlier than 2000. This seems to indicate that this use of "any" is confined to colloquial registers of speech, and is not accepted by copyeditors and other gatekeepers of "accepted" grammar. There are some examples of "care any about" from books published after 2000 in Google Books. However, most of them seem to be used in dialogue or deliberately colloquial passages. Not the answer you're looking for? Browse other questions tagged american-english or ask your own question. Is “take care” always a friendly utterance or can it sometimes be considered threatening? Is “gonna have to” an Americanism? Is “evidence” as a verb an Americanism? When did “I could care less” (rather than “I couldn't care less”) become popular? Is “pipe dream” an Americanism?